​MIT researchers have developed a very small wireless track pad, which resembles a fake fingernail. The idea of the gadget is to make it possible for users to control their devices when they are at their most busy. The device is a very small touch panel attached to a thumbnail and is controlled by a forefinger of the same hand. This wireless track pad can be useful for people who are cooking or repairing something. Indeed, such a device gives them an opportunity to turn the page of a recipe book or to turn on music without any breaks in the work. The prototype has been developed by MIT (Massachusetts Institute of Technology) Media Laboratory researchers. When it comes to size and mass, NailO is similar to a quarter coin: 24.3 millimeters in diameter and weighing 5.7 grams. The device includes a mini battery, a microcontroller, a Bluetooth radio chip for wireless communication, capacity sensor and a decorative lop layer. A user keeps their a finger on Nailo for 2-3 seconds to turn it on. You can control a cursor with this device by moving a finger over the surface of the gadget. In order to“click”it is necessary just to press the device with a finger. 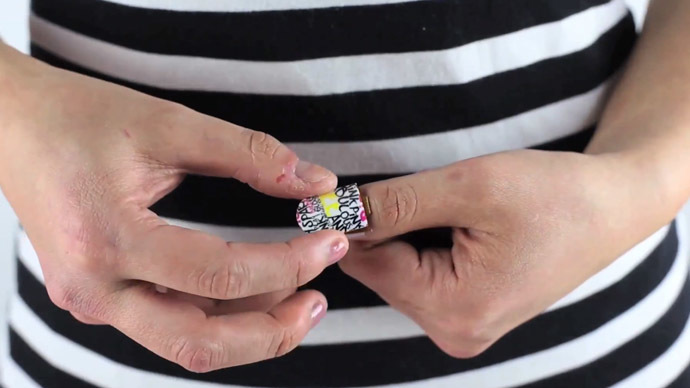 Hsin-Liu Kao, one of the lead authors of the study, explained the device was inspired by the colorful stickers that women use for their nails.“It’s a cosmetic product which is popular in Asian countries,”said Kao. Developers believe that the commercial version of NailO would have a detachable membrane on its surface, so that people could change it in accordance with their style. Artem Dementyev, the other lead author, told MIT News that because of the size of the gadget it was especially difficult to put the antenna far enough from chips so that it does not interfere with them. Moreover, the researches even had to travel in China to buy suitable batteries, which are only half a millimeter thick. Steve Hodges, the head of the Sensors and Devices group at Microsoft Research in Cambridge, England, said that different ways of displaying and controlling devices while a person is on the go are going to be increasingly important. NailO is just a prototype, which will be presented this week at the Association for Computing Machinery’s Computer-Human Interaction conference in Seoul, South Korea.